Need a great resume now? Tips and tricks for Pilots and Mechanics. Templates included! 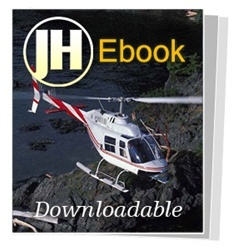 A downloadable EBook on resume writing for helicopter pilots and mechanics. EBook includes cover letter and resume templates. Bonus material includes a comprehensive list of common interview questions. A resume is what you use to get a job right? WRONG! Using different highlighters (e.g., bullets, arrows, etc.) creates interest and excitement.FALLACY. Just because you have the capability to use different highlighters does not mean that you should display them all at once. In fact, too much variation can move the recruiter’s attention to your design elements, rather than your credentials. Use one highlighter consistently. The absolute best way to deliver a resume is to deliver it to the hiring authority in person. Having said that, we all understand that the helicopter industry is not really a local market, but more of a global one. Odds are that if you are applying to a new company, it is not located in your home town and this makes hand delivering your resume perhaps out of the question. So then what?? FLIGHT TIME, AIRCRAFT EXPERIENCE, AND <?xml:namespace prefix = st1 ns = "urn:schemas-microsoft-com:office:smarttags" />MISSION EXPERIENCE ARE KING!! Keywords – This is becoming much more important in the world of Human Resources and Recruiting in the digital age. Companies get thousands of resumes and typically will store them electronically. Since they are stored electronically, they are searched electronically as well. In our recruitment business at Justhelicopters.com we have a system which stores resumes based on a set of several hundred predetermined helicopter industry keywords. HOT TIP #2 – DO NOT INSERT PICTURES into your resume. First, most electronic recruiting solutions do not know how to process the pictures and may change the format of the resume itself. Secondly, for some of the less “beautiful” candidates, your mug shot might just turn off the reviewer for whatever reason. Let them first judge you for the resume itself, then by the phone interview. Answers inside the EBook from hiring managers of PHI, Air Evac, Evergreen AK, REACH Air Medical and Haverfield Corp. If I could give one piece of advice to resume writers it would be this. One resume does not fit all. Tailor each one to the JD (job description). If you can, use as many of the exact same words that are in the JD in your resume. This WILL get the attention of the hiring authority. What helicopter hiring managers look at first! The resume writing guide is invaluable! I found it very informative and it proved extremely helpful in creating my first aviation related resume. The sample interview questions and information from major helicopter companies on what they look for in resumes and candidates were great additions. This is worth every penny to anyone wanting to create or rewrite their aviation resume! BUY IT NOW, you won't be sorry!